A beautiful architectural evidence of the knowledge, skill and scientific intelligence of Ancient India, the Jantar Manta is one of the 5 structures built by Maharaja Jai Singh II of Jaipur. A great astronomer himself, the Jantar Mantar is known to house 13 architectural instruments of astronmonical value. It is said that since Jai Singh was such a great astronomer, that the Mughal Emperor Muhammad Shah had even given him the task of revising the astronomical tables and calendar. This magnificent observatory is believed to have been made of marble and stone it is believed that the entire structure has an engraved astronomical scale. In the year 1948, the Jantar Mantar had got the status of a national monument. 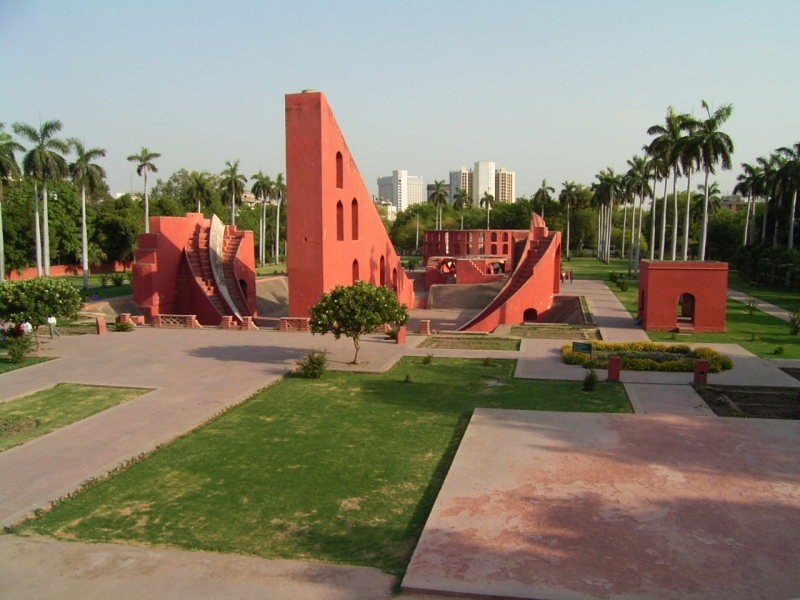 The Jantar Mantar has been a great attraction for not only historians of the country and world at large, but also architects and scientists across the globe. The Jantar Mantar is believed to consist of 14 geometric devices that were used for forecasting weather, predicting planetary behavior and movement, measuring time and even discovering extraterrestrial altitude. These unique and ancient astronomical devices are believed to be fixed and pointing in specific directions. Being an astronomer himself, Jai Singh is said to have studied and gained his knowledge into this science from different works of not only Hindu but also English and Muslim astronomical books. It was this inspiration and passion that inspired him to build observatories at Mathura, Benares, Jaipur, Ujjain and Delhi. The entire structure is said to have taken almost 7 years to be completed and completely operational. The main instruments within the observatory of Jantar Manat Delhi include the Ram Yantra, the Samrat Yantra, the Jayaprakash and the Mishra Yantras. The Samrat Yantra is also called as the Supreme Instrument, is a huge equal hour sundial. Believed to be 10 feet thick, 70 feet high and 114 feet long, the Samrat Yantra has a 39 m hypotenuse that points to the North Pole and is parallel to the axis of the Earth. Though sundials already existed, this dial turned the basic sundial into a precision tool that could be used for measure declination and other related coordinates of heavenly bodies. The Mishra Yantras is a unique instrument that enables one to understand the noon timings in different cities across the globe. There are pillars in the southwest of the Mishra Yantra that were used to measure both the longest and shortest days of the year. The Ram Yantra is actually a device of two large open buildings; this Yantra was used to measure the altitude of stars, which can be considered to be equivalent to measuring the longitude and latitude of the earth. Jantar Mantar today stands as a magnificent example of the vast scientific acumen and heritage India once had, even though it is not used in modern research facilities today. Even today numerous astronomers, scientists, students, architects and historians are amazed at the skill and knowledge ancient India had in this field. The Jantar Mantar is a definite must visit while in the city of Delhi. Been to Jantar Mantar ? Share your experiences!